This probably requires some explanation. Door County, Wisonsin, seemed like it was going to be a pretty tame place. Big farms, lotsa golf courses, a couple of wineries. One of those places that we feel like we should be visiting in another 30 years or so. Hilton Head, that's another one. Not so, Door County! Apparently, this pastoral facade hides a little bit o' the rowdy! It turns out that it is, in fact, one of those places where hundred upon hundreds of boats, loaded with high school and college kids drunk as monkeys, drop anchor off the beach and party all summer. It's beach volleyball, beer in the hayfields, chantilly lace, and a pretty face, and a ponytail hangin' down. Not to mention the drive-in. Actually, we were lame. 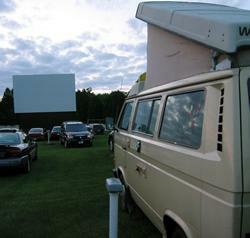 While all the cool kids were at the bars and playing volleyball in the fields, we went to the drive-in and ate noodles. 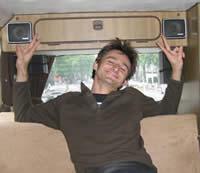 Anthony had never been to a drive-in before, and certainly neither of us had been to one Badunkadunk style. We were outdone only by a tricked out hearse with Munsters-style pipes sticking out of the hood and lettering on the back that read, "A Hearse of Ill Repute". B-E-A-yootiful. To be fair, we did stop by the volleyball shin-dig, but it was a league shin-dig and we weren't on a team, so we just watched for a few minutes. We had already played for a while with a couple guys at the beach, one of whom looked exactly, and we mean exactly, like Luke Melia. And he was playing volleyball. He even talked like Luke and had roughly the same temperment, though it quickly became apparent that he could drink Luke under the table. He disavowed any knowledge of Luke or the Melia family and frankly seemed completely uninterested in hearing how much he looked like a guy he's never met. We had our asses handed to us pretty well in all four games, but it was fun to be playing volleyball again. We'll have to make it at least a semi-annual habit. © 2002, 2003 Anthony Hecht and Liz Jones. All rights reserved.